The ice-cool Swede against the hot-headed American: that’s how tennis players Björn Borg and John McEnroe were known, and that’s mostly how they are portrayed in this drama. 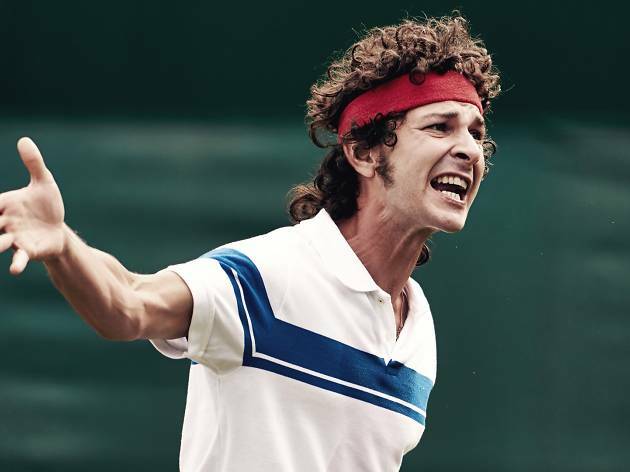 Shia LaBeouf is a natural choice for McEnroe, the talented but unruly young buck prone to temper tantrums that became infamous in the run-up to the 1980 Wimbledon final and spawned the catchphrase, ‘You cannot be serious!’. Sverrir Gudnason is also a great fit and the resemblance to Borg is uncanny (his eyes are wider apart, but that’s about it). If you’re too young to remember, you should know that these guys were huge news in their day: household names that became tabloid catnip thanks to a combination of extraordinary playing and contrasting personalities. Or maybe not. This multi-lingual film from Danish director Janus Metz delves back into Borg’s childhood to reveal a young man with anger management issues that were only eventually harnessed by his trainer, Lennart Bergelin (Stellan Skarsgård). In one key scene. Bergelin instructs the player to channel all his fury into the match: show no emotion outside of the game. It goes some way to accounting for Borg’s placid manner, though it also speaks volumes about his commitment. ‘Borg vs McEnroe’ is as much about the psychology of sport and success as it is about rivalry: these men sacrificed almost everything to get to the top. Given Borg’s subsequently controlled behaviour, it’s a little frustrating to be deprived of quite as much access to McEnroe’s private life. Sure, we see the pushy parents, and a bit of night clubbing, but we don’t get to the heart of the man. Nor does the film mine his character for comedy: LaBoeuf is good, but his performance is – ironically – desperately serious, as is the tone of this film. Still, the final match is an absolute nail-biter, reminding tennis fans how electric this sport can be. To its credit this feels much more European arthouse film than American blockbuster biopic. It certainly explores Borg’s character in much more depth (and screen time) than McEnroe’s. 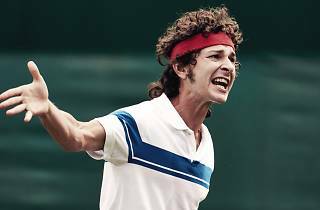 However Shia Leboeuf - whilst looking and sounding very little like McEnroe - gives the best performance of his career and is very convincing. I was expecting a typically loud and harsh performance - more of a caricature. Thankfully this isn’t the case - the film doesn’t play up the ‘you cannot be serious’ moments or go for overly gratuitous slo-mo during the tennis scenes. Sverrir Gudnason is brilliant as Borg and his underplayed, nuanced performance anchors the entire film. He conveys the ‘ice man’ as a meticulous, professional yet deeply troubled individual - the flashbacks to childhood lessons are raw and compelling. It’s beautifully shot and definitely one to catch on the big screen.